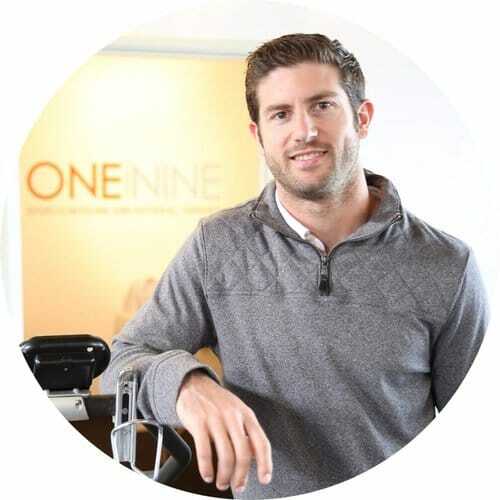 One Nine is a team of honest experts supporting active adults and athletes so they can live the lifestyle and achieve peak performance, for the long haul. Our Doctors of Physical Therapy hold specialty certifications in strength and conditioning, sport-specific areas, and manual therapy, so we can bring the best to each client. Clients who experience exceptional results with One Nine are lifestyle and competitive athletes. We get results for people who are driven to work for the life they want to live. People who want to be active and are held back or limited by injury, weakness, dysfunction, or other issues benefit from our treatments. This includes high school, collegiate, and elite athletes, as well as active adults. Our Physical Therapists are movement specialists. This means that we analyze the particular movements in a given sport or activity, break them down into components, and identify the areas of weakness that need to be corrected. Through video analysis, collaboration, and research, we find the best methods for athletes in all sports. In San Diego, we are commonly working with surfers, cyclists, runners, tennis players, golfers, and recreational athletes. We have extensive experience with high school and collegiate soccer, volleyball, baseball, basketball, football, lacrosse, track, field hockey, and horseback riding. We know the impact that injury can have on performance, progress, and confidence. A holistic and functional basis for healthcare produces greater results. For this reason, we focus on the person, not the injury. We address the impairments, not the diagnosis. We get you out of pain swiftly, moving early, and faster return to activity. Whether you are an athlete looking to get back to sports, or a desk jockey hoping to play with your kids without pain, we have you covered. All our patients experience the same expert, high-touch, personalized care every step of the way. If you are looking for a team that looks out for your best interest instead of working based on insurance reimbursements, One Nine is the physical therapy provider for you. The One Nine Method is our secret sauce. There is no program like it - combining the latest evidence from Physical Therapy, Sports Performance, and Sports Psychology. This program consists of a Full-slate assessment, deep dive education strategy, and manual and exercise interventions - custom fit to the individual client. The 9-elements Assessment objectively measures lifestyle factors, history, impairments, experience, and other critical elements to rehabilitation success. This allows the therapist to identify and prioritize areas of weakness to maximize potential in less time. The identified elements to be addressed are paired with principles of movement - the foundation for which the manual and exercise interventions are based.